My bookstore takes National Poetry Month pretty seriously. One of our traditions is a daily poetry reading throughout April. I’m linking to this one in particular not simply because I’m reading or that the reading itself is particularly good (though, let’s not kid ourselves, it’s not like these aren’t factoring into my decision), but because I think a good many of you would really like the work of Daniel Borzutzky. Give him a look. This may not be only bookish post before the end of 2015, but I thought I might do at least one a bit earlier than normal. As many of you may know, I manage a bookshop in Oakland, and occasionally write here & elsewhere about bookshop sort of things. The bookseller in me felt compelled to use what forum I have here at AUFS not simply for self-indulgent evil (e.g., my serialized short stories), but for greater cultural good! To that end, I present a few books I heartily recommend for you, the educated and/or curious, who frequent these parts. I trust a good many of you already about the next book, but it bears repeating. 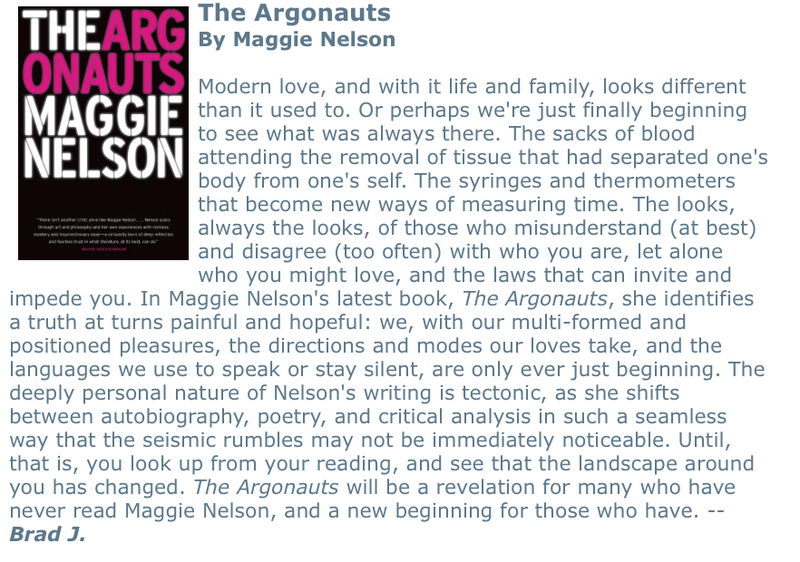 If you’re not talking to somebody this summer about Maggie Nelson’s latest essayistic poetry, The Argonauts, I’m not sure what it is you have to talk about. Next up … and, yes, I know, all of these so far have been hardcover, but I think this is the last one such … is Nell Zink’s Mislaid. Suffice it to say, it’s been a good year for Nell. There is bound to be a backlash — maybe there already is — what for all the hype and such. But, who cares, she’s funny & smart as hell. What’s more, she knows it. I will defy the inevitable defiance and encourage you to read along. My blurb review made its way to an industry newsletter. Poetry! Everybody reads it during the summer, right? Maybe not . . . but if, so, find yourself a copy of Nathaniel Mackey’s Blue Fasa. Don’t be surprised when you begin, and it seems as though you’ve entered a concert mid-program. Mackey’s poetic project has spanned several books now, each one introducing a new movement, all of them influenced by a variety of rhythms and instruments. This kind of description is often attended by poetry workshop eyeball . . . but, if you just go with it, and you keep close at hand Kevin Coval &c.’s The BreakBeat Poets, ping-ponging your eyes back & forth from Mackey to it, you’ll find one of the few unrestrained joys you’re likely to have this summer. Finally — and I recommend you just keep this one around you all summer, in a bag, to punctuate whatever else you might be reading, from this list or others — it’s much better than Twitter, I promise — I implore you to get a copy of Sergio Pitol’s classic (in nearly every language but, until now, English! ), The Art of Flight. In an age where everybody it seems is writing an autobiographical essay, Pitol is, I think, the master. Memory curves into anticipation, always rounding back into one another, and through it all PItol is the multi-cultural maestro, never so much guiding you along as two steps further, hopping over the names that he’s dropped into puddles. He: Accidental harm & love are not unlike time. We can look back & ahead only so far or so wide. Pleading anything more, successfully or not, is pretense, unavoidable though it may be. I originally read your note in the dead of night, having awakened at 3 or 3.30 in search of a glass of water, and have ever since been toying with the notion of what happens to silent compliments — the ones stowed for later in the pocket, or under the hat for safe-keeping, or even under the ground for memorialized forgetting. The words not said, don’t the poets & mystics talk about how they’re the ones with the most power? But do words need to have power to act? I’m not sure. Clumsiness, awkwardness, trains of thought that’ve skipped the tracks and emptied their cargo — compliments regrettably given, praise painfully accepted — these are the moments, the silences that aren’t the terminal sort for which poets & mystics clamor or yearn — that occur along the way … to what, exactly? … frustrating all our noblest intentions and greatest efforts — such as when you excitedly read aloud the most ‘beautiful thing ever’, whatever it is, to a kindred, and hear their coldness & inattention as you do; and, oh, you’re loathe to continue, but you do, and somewhere within (but not identifiably because) the persistence something happens — perhaps to neither of you — for you may remain disappointed and she bored — that redeems the frustration and inattention — that doesn’t change a person or circumstance so much as affirm and allow both — doors thrown open and welcomes met with wine — and upon reflection, maybe, sometimes, one of you, maybe neither, maybe somebody sitting nearby watching, is pleased to have bore witness. This, our affair, it lacked reciprocity. There is also a real need for the work one shares with others to be about more than the one who shares? For some this motivates political poetry (about people & systems). For others, religious verse (about practices & signs)? Or, still for others, like me, & I think you, to the necessity that a truly memorable writing is one that is so stylized & intentional that the author herself is lost within, but by no means vanished by, the language? No, none of this should come necessarily at the loss of the writer, her identity, or luggage of issues, etc. When done well, shouldn’t it deepen their significance beyond the mildly therapeutic, if nevertheless flatulent, confines of “expressing yourself”?
. . . the complexity of movement, and movement requires the sort of friction that will always rub somebody wrong. If there’s to be a real peace, of the sort you’re looking, surely it is as tentative as a handshake deal. When, whether as an achievement or a goal, has it not come without a boot on the back of somebody’s neck? Our sense of an ending comes too easily. Mourning and remembrance end long before our bodies do — our ashes burn longer. Even if your fundamentalists are right, it’s because our wicked ways are as fertile as our bodies, the wages of sin a hand-me-down prize, for the earth and its beasts. Even when these bodies and all that they carried within, . . .
3. an abnormal and overwhelming sense of apprehension and fear often marked by physiological signs (as sweating, tension, and increased pulse), by doubt concerning the reality and nature of the threat, and by self-doubt about one’s capacity to cope with it.